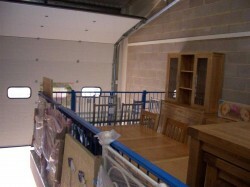 Mr Pine is a pine furniture retailer based in Portsmouth, Hampshire. 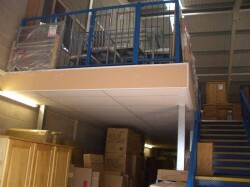 When trying to maximise the full use of the available height of their Portsmouth retail unit, Mr Pine called upon Hampshire Mezzanine Floors to help out. HMF added another tier to their existing mezzanine floor and fitted all the necessary 1-hour fire protection, also enclosing the rear fire escape to comply with the latest Building Regulations requirements. 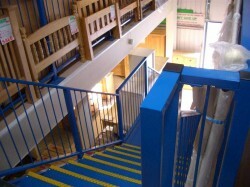 The new floor area totalled 130m², stood 6m from the ground and was accessed by a new ambulant disabled public access staircase which was painted to match the existing Blue colour scheme. 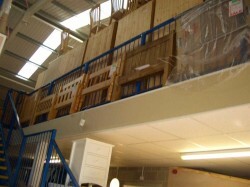 The new mezzanine floor was designed to hold heavy pine furniture and the general public so was designed to 5.0kN/m². This has almost doubled the size of the available retail space allowing a vast increase in stock holding and display room space without the need to relocate or set up another retail unit. As the client needed to continue trading throughout the extension, HMF worked out a quick installation programme, completing all the works in just over 2 weeks. The £25K installation was completed on time and within budget.